NANAO, Japan, March 20, 2019 /PRNewswire/ -- This tour, traveling the Dragon Route on Harley Davidson bikes and covering approximately 1,000 km over 5 days, began on March 4, 2019. The Route travels from the Pacific Ocean point to dragon-head shaped Noto Peninsula facing the Sea of Japan. Sponsored by the Japan National Tourism Organization, the Dragon Route Promotion Council organized this FAM trip with Moto Tours Japan targeting foreign visitors. Members of Eagle Rider were invited along with representatives from the Harley Owners Group to tour around the exquisite locations in Japan. The group departed from the Rental819 Shop at Chubu Centrair International Airport on March 4 and visited Nagoya Castle, Atsuta Shrine and Gifu Castle. From there, it continued on to the 1,300-year-old Natadera Temple in Komatsu City, Ishikawa Prefecture, and then to the Motorcar Museum of Japan, where it enjoyed the profound culture and craftsmanship of Japan. On the 6th, the group rode approximately 300 km to the 1,200-year-old Wakura Hot Springs. Looking out over the Sea of Japan, the vast gardens of Kenrokuen was a heavenly bliss. The highlight of the tour was Noto Peninsula. 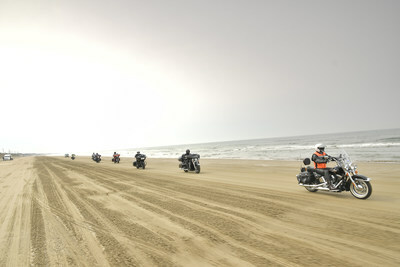 The Chirihama Beach, stretching 8 km along the Japan Sea in Hakui City, is one of the rare places in the world where you can ride off-road along the water's edge, leaving the bikers stirred with emotion. At Keta Shrine, all the participants offered sprigs of a sacred tree in accordance with tradition and felt the invisible power of the place. At Wajima, "The City that Welcomes Riders with a Smile", they were welcomed warmly by the mayor and many other citizens. The goal of this day was Tadaya, a traditional Japanese inn. There, the group observed the natural beauty of Noto Bay and received the best welcome from the highest quality accommodation in the area after riding in sub-zero temperatures. The beautiful pristine nature and heritage sites along the Dragon Route are hidden gems in Japan. It was a sensational FAM tour that added delights of the wind, the smells, the light of the sun and the close contact with the local people passing by that can only be enjoyed by riding a motorbike.